China Expels BuzzFeed Journalist Who Reported on Mass Detentions, Surveillance - Integration Through Media ....! China’s decision to effectively expel a BuzzFeed journalist who won a human rights award for her reporting on the mass incarceration of Uyghurs and other Muslims in “re-education” camps has refocused attention on an unfolding human rights crisis in its northwestern region of Xinjiang, a press freedom group has said. The decision by China’s foreign ministry not to renew the visa of BuzzFeed’s China bureau chief, Megha Rajagopalan, came after she carried out extensive investigative reporting into heavy surveillance measures in Xinjiang, and the use of huge camps to detain Uyghurs and other minority groups for “re-education,” the New York-based Committee to Protect Journalists (CPJ) said in a statement. “I also want to make clear that though I can’t do it from inside China anymore; I’m not going to stop reporting on and speaking about state surveillance, repression and incarceration of millions of Muslim ethnic minorities in Xinjiang,” she wrote. Rajagopalan, who had covered Asia for BuzzFeed News since 2016, had won a 2018 Human Rights Press Award for her report on Xinjiang’s heavy surveillance measures and re-education camps, the CPJ said. “Denying a visa to BuzzFeed reporter Megha Rajagopalan is a transparent attempt to stifle news coverage of how China treats the [Uyghur] population of Xinjiang,” the CPJ’s Asia program coordinator Steven Butler said in a statement on the group’s website. “If Chinese authorities truly believe their insistence that they are not committing human rights violations in Xinjiang, they should open the door for more journalists to freely report on the issue,” Butler said. Rajagopalan is the latest in a string of outspoken foreign journalists to be forced to leave China by the authorities after covering “sensitive” topics. In December 2015, China’s foreign ministry refused to renew the working visa of a French journalist who angered Beijing by writing an article critical of its policies in Xinjiang. Ursula Gauthier, the Beijing-based correspondent for French news magazine L’Obs, had “flagrantly championed acts of terrorism and acts of cruelly killing innocents,” the foreign ministry said. Gauthier meanwhile said she had done no such thing. Gauthier had suggested that a string of violent incidents in Xinjiang could be the result of oppressive policies, and questioned China’s motives in expressing sympathy for the victims of the Nov. 13, 2015, attacks in Paris. In May 2015, Qatar-based satellite channel Al Jazeera closed its English-language Beijing bureau after Chinese officials revoked its correspondent’s visa and refused to allow a replacement journalist. Melissa Chan, Al Jazeera English’s China correspondent from 2007-2015, had covered numerous stories about the environment, social justice, labor rights, and human rights. A survey carried out by the FCCC at the start of the year found that 40 percent of China-based journalists felt reporting conditions in 2017 had deteriorated from the year before, compared with 29 percent in the FCCC’s 2016 survey. Reporting grew more difficult in many areas of China, but in particular Xinjiang, China’s westernmost region, the survey found. It said 73 percent of respondents who traveled to Xinjiang in 2017 were told by officials and security agents that reporting was prohibited or restricted, compared with 42 percent in 2016, the group said in an annual report in January. It said 15 percent of respondents said they encountered problems during the visa renewal process, compared with just six percent in the previous year, and twice the number of respondents said their problems were related to the content of their reporting. Correspondents also reported higher levels of concern about surveillance and invasion of privacy, as well as greater pressure by overseas Chinese officials on media organization headquarters, it said. Earlier this month, the United Nations Committee on the Elimination of Racial Discrimination (CERD) expressed concerns over China’s mass internment of ethnic Uyghurs and restrictions on their religious freedom. Beginning in April 2017, Uyghurs accused of harboring “strong religious views” and “politically incorrect” ideas have been jailed or detained in political “re-education camps” throughout the region. 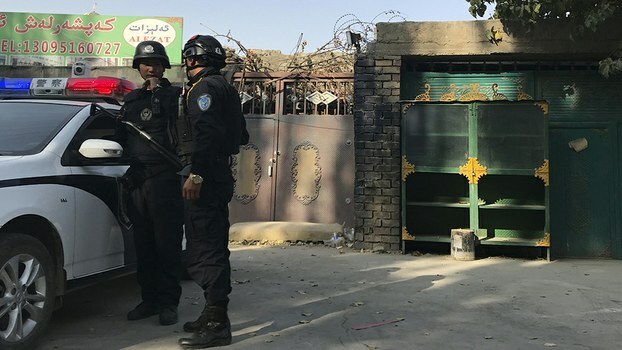 Aside from the brief mention in the article, China’s central government authorities have not publicly acknowledged the existence of political re-education camps in Xinjiang, and the number of inmates kept in each facility remains a closely guarded secret. But in interviews with RFA, local officials in many parts of the region have described sending significant numbers of Uyghurs to the camps and even described overcrowding in some facilities.